Diets high in fats—especially saturated fats—can lead to chronic inflammation, which scientists believe may give rise to a range of health issues from heart disease and obesity to diabetes and even depression. That's why nutritionists and dietitians keep reminding us to cut back on foods like cheese, bacon, butter, and so many other delicious foods that make up the bulk of America's diet. But if you're not yet ready to scrap dairy and animal products from your diet entirely, a new study suggests you may be able to hack how your body responds to their ingestion by timing when you put them in your mouth. According to a recent report fresh from Texas A&M University, scheduling our intake of saturated fats earlier in the day (i.e., before lunchtime) may reduce just how inflamed our cells become in response to them. The study also found that the later we eat foods chock full of saturated fats, the more likely they are to disrupt our body's internal clocks—and, as a result, exacerbate any inflammatory response to the foods we eat. This leads us to feel sluggish and may screw with our ability to get to bed at a decent hour. In fact, the researchers went so far as to equate the effects of consuming a high-saturated fat diet with jet lag. In a press release, they explain that a particular type of saturated fat (palmitate) resets some cells in your body to different time zones. "Humans can manage all right when their entire bodies move into a different time zone," the release reads, "but inflammation seems to result when some cells are shifted but others are not." 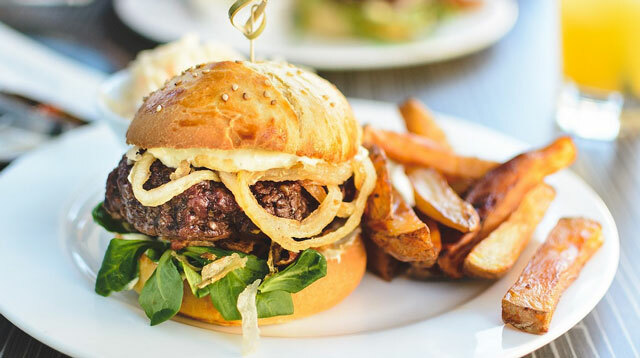 For those of us who would prefer to save our burgers for lunch or dinner (not breakfast), however, the lead researcher of the above study points toward some alternatives that can offset saturated fats' ill effects on our cells and circadian rhythms. Supplementation with the anti-inflammatory "good fat" omega-3 (aka DHA), for instance, can "disrupt" the response our cells have to being slammed with too much saturated fat. (You can find capsules of the stuff at your local supplement store. Or you can just eat more omega-3-rich fish.) And consuming an otherwise healthy diet chock-full of veggies, fruits, nuts, and lean meats may buffer our health from the negative effects of occasional binges. TL;DR? If you're feeling groggy most days of the week, science suggests cutting back on processed foods and greasy menu items from the afternoon onward may help you dial down inflammation and right your biological clock. Adding leafy greens and other anti-inflammatory edibles will likely, research shows, aid the reboot.